I know many of you are not on Facebook, so are not able to keep up with my travels. It's also bit difficult posting while walking and sometimes I don't have a signal either. When I get home I don't have time and am usually planning the next day, so apologies for not keeping you up to date. I am having 3 days off now before my final run in from Silverdale to Blackpool which is 55 miles. I've completed 377 miles in 26 days so far. The Lake District section was 104 miles. So By Sunday, I hope to have completed the entire route of 432 miles in 30 days. I've also raised just over £2000 to date for NW Air Ambulance. Anyway, I've had a great time and spoken to lots of people, many with a story to tell. I've educated many and made it quite clear that it is not the Old Boundary I am walking but the Real one. I spoke to a young reporter called Jo Timan from Bolton News on the phone this morning. He contacted me and was on the phone for ages. He was very interested and covered all aspects of our group, shows, merchandise, signage, conversations, travel to points on route and so on. Hope we get a good positive article in the Bolton News and not one which is twisted. I think we will be ok. I have decided to write a book on my journey and have a good title in mind! I will pull no punches and tell it how it is! It will be a Bill Bryson style book I think and have already spoken to Carnegie Publishing at Lancaster who think it's a great idea. The boss will be ringing me back. There will also be a companion guide hopefully, so a lot of work to be done. I will provide an update for the next newsletter, but I need your help as well. Please send Pauline articles as we are very short and need to get a newsletter out in August. It is very late. Likewise with the magazine we need articles. Please, beg, borrow or steal as I simply haven't the time. Bill and I are going to Ulverston Show on Wednesday with our gazebo. If you are on Facebook, find me - Philip Walsh. Picture of me on comedy carpet "Lets do it"
Andy. Edward Lee of the Burnley Express is going to contact me after Sunday. I will finish at Blackpool Tower on Sunday afternoon. Time to be confirmed. Hope the Knott End - Fleetwood ferry is running! 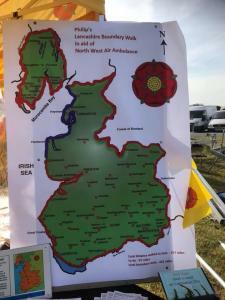 Day 27 of my Lancashire Boundary Walk. Good morning folks. I’m starting my final leg of the walk today from Silverdale to Blackpool Tower. Today I am aiming to get to Morecambe by walking along the coast via Jenny Brown’s Point, Carnforth, and Bolton-le-Sands. I’m on the 7.53 Virgin Trains Service and will change at Lancaster for Silverdale. The train is full of Burnley fans making their way to Aberdeen for a Europa League football match. Lots of light hearted banter from the fans who at the moment are well behaved and polite. Andy Devanney are you going?